These instructions are based on my own installation of the Baer rear disc conversion kit. Now that there are knock-off kits available and people are piecing their own setups together without fully understanding how they work, I think it will be helpful to post up the full installation documentation along with some explanations of the more subtle details that may be important but easily overlooked. I highly encourage anyone attempting to build their own kit to ensure that they've read through these instructions thoroughly and haven't missed anything. If there is something you don't fully understand, take time to do more research or you'll be setting yourself up for failure. 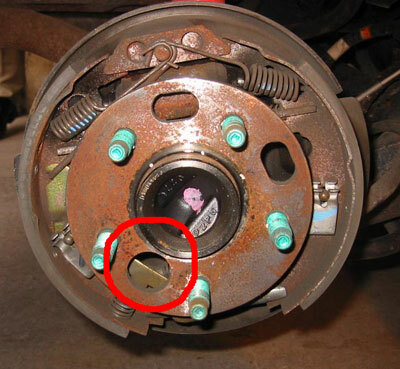 The brakes are the most important safety item on your car and any sort of failure of the system could be catastrophic, leading to serious injury or death. 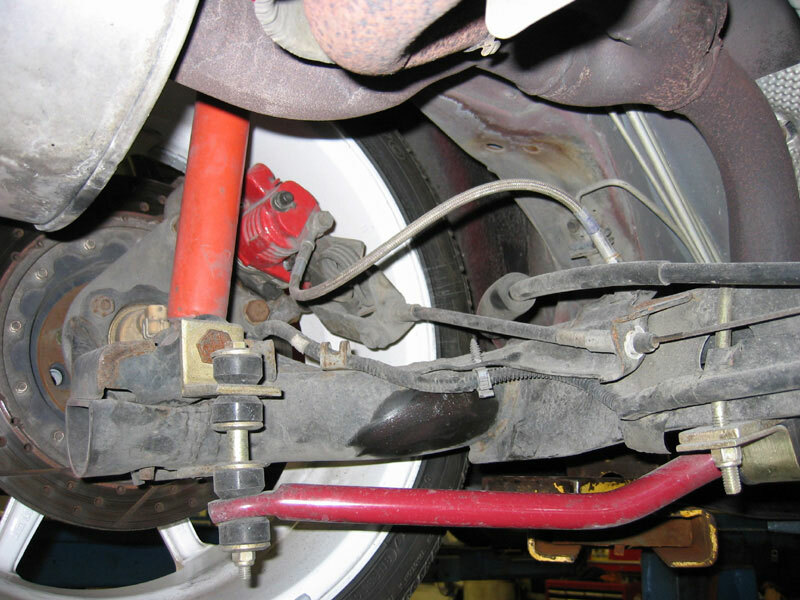 If it happens that an accident is caused by your modification to the brake system, I don't think it would be unlikely for you to be held liable in a court of law and penalized severely. Be sure you know what you're doing before attempting any such modifications. 6 7/8" Parking Brake Cable Tension Spring (if not already equipped with one). Parking Brake Cable Tension Spring Stop (for all cars). Having the proper tools can make a world of difference. I had only metric flare nut wrenches and ended up stripping most of the tighteners on the hard lines. I had to resort to vice grips to tighten them back down. Chock both front wheels to ensure the car doesn't roll. Jack up the rear of the vehicle and secure with sturdy jack stands. If you've never removed the drums before, there will be some metal retainers on the lugs. Pry these off with a pair of pliars and discard them. If the drum is difficult to remove, tapping it with a hammer can loosen it. 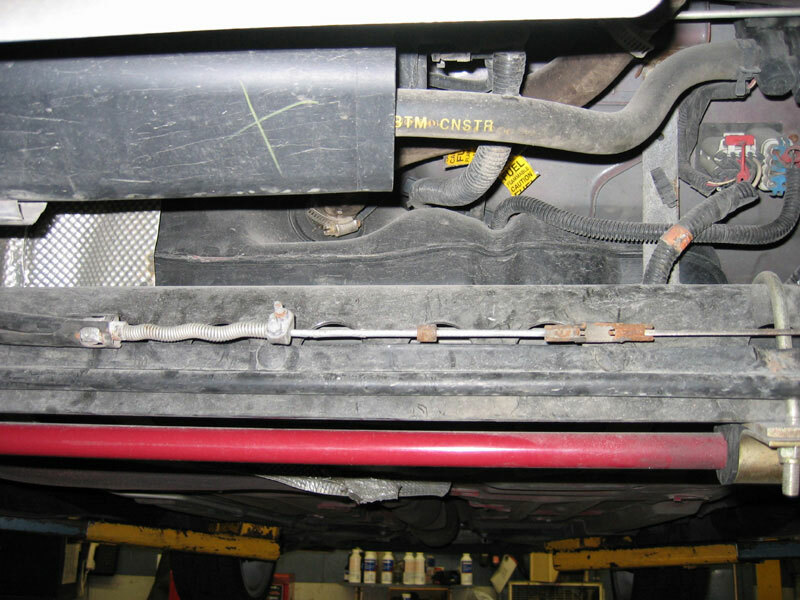 Disconnect the hard line from both the back of the wheel cylinder and the rubber hose leading to the car. The hard line may be removed and discarded as it will not be reused. Disconnect the parking brake cable from the center adjustment mechanism. I found it quite difficult to give the cables enough slack to release them from the fittings and ended up just cutting them off. Disconnect the ABS sensor and remove it from the back of the hub. Remove the backing plate that is secured through the hub with 4 nuts and bolts. 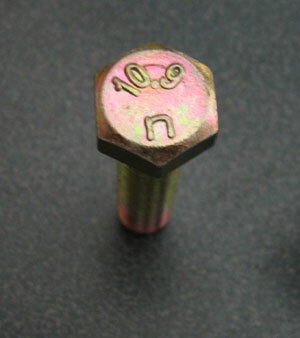 The bolts are accessible through a hole in the hub as shown in the picture. 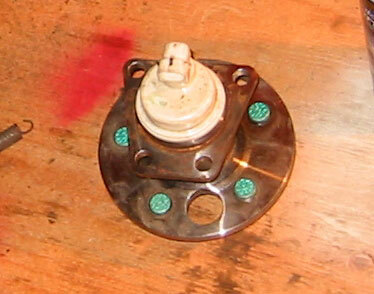 Simply turn the hub until the hole lines up with the bolt. Keep these nuts and bolts as they will be reused. You may have to tap the back plate off with a hammer. Mine seemed to be a part of the hub. Note that we stripped one of the torx head bolts beyond use and nearly had to drill it out. Using an impact driver will prevent this from happening. If we'd had one at the time I'm sure it would have saved us a whole lot of stress. I replaced them with normal hex head bolts to save me the trouble in the future. It's interesting to note that a stripped out torx bolt is curiously similar to an allen-head bolt. We got it out by hammering an allen key bit into it. Hopefully none of yours will come to that. 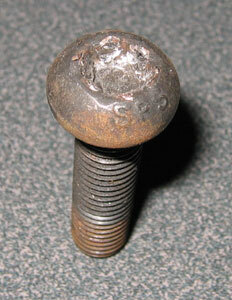 When replacing any bolts, ensure that they are of an equivilent or higher grade. These must be graded at least 10.9. Never use replacement bolts if you are unsure of their grading. Clean the axle and hub surfaces thoroughly. Failure to do so can prevent the surfaces from mating properly and may cause "rotor runout" in the system. Install the caliper bracket as shown. The bracket should be positioned so that the spacers face TOWARD the caliper. If your bracket doesn't have spacers, you may need washers to properly position the caliper. It will be sandwiched between the axle and the hub just as the drum backplate was. The bracket should be mounted so that the caliper mounting holes are up and toward the front of the car (approximately 1 o'clock position on the passenger's side). Torque the bolts to 38 ft. lbs. Reinstall the ABS sensor in the back of the hub. Place the centering ring for the rotor on the hub. Note that the centering rings are extremely important and you cannot simply put the rotor on without them. If you don't have them and the rotor shifts away from center, you will run into some serious balance issues. Remember that these rotors have a lot more weight further from the center than what the drums had. Centering rings are available from any wheel shop. If you just bought standard Corvette rotors, they may have to be machined to fit the rings. If you bought them from Baer or some other company that produces aftermarket conversions, they should also be able to supply the proper rings. Place the rotor on the hub and secure it with a lug nut to keep it in place. Install the caliper with the supplied bolts. If you're building your own kit, ensure that the bolts you're using are automotive grade (at least 10.9). If your bracket doesn't have the caliper spacers mounted to the holes, you may need some washers to position the caliper properly over the rotor. With new pads in the caliper, it should fit snugly on the rotor and flush against the bracket. If there is any gap between the caliper and the bracket and it is pulled flush by the bolts, the pad will be held against the rotor and you will have problems. The bleeder should face up and the parking brake mechanism should face down. Torque the mounting bolts to 85 ft. lbs. 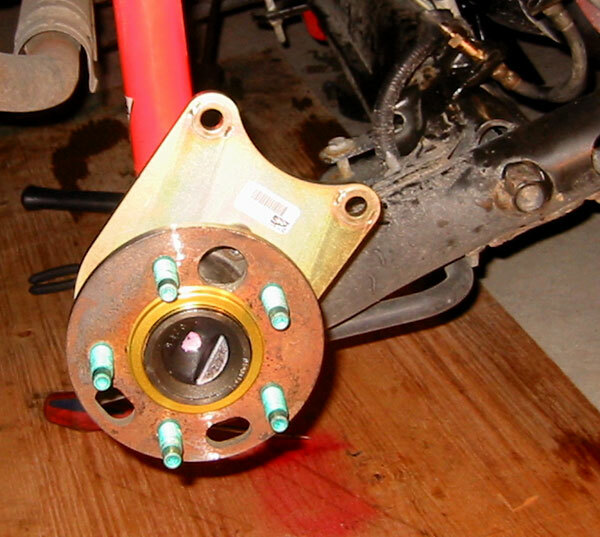 Ensure that the rotor can turn somewhat freely within the caliper. Since both are new, it may not spin completely free just yet but it should turn easily by hand. 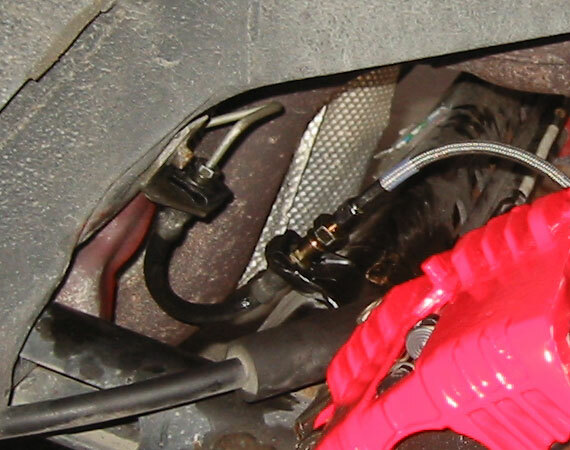 Install the 10mm - 3 fitting onto the brake hose as shown in the the picture. Install the brake hose on the caliper with the banjo bolt pointed straight down. Install the other end on the previously installed fitting, routing the hose as shown in the picture. MAKE SURE THE HOSE DOES NOT CONTACT OR CHAFE AGAINST ANY VEHICLE PARTS. Torque the banjo bolt and hose to brake adapter fitting to 15-20 ft. lbs. Ensure that the banjo bolt continues to point straight down. Install the new parking brake cables. The ends of the housing have two grooves for the E-Clip. Use the outer-most groove and allow the cable to slightly float. The main cable back to the parking brake handle will retract. Simply pull it back out of the housing to reattach. Due to the way the parking brake mechanism works, when setting the brake you should always press the brake pedal firmly to the floor before pulling up the brake handle. Set the spring tension on the parking brake cable. Ensure the parking brake handle is in the off position. Late model J-Bodies already have a factory spring installed on the main cable. If your car is so equipped, install a new cable stop by compressing the spring down 6" length and then holding it there with the stop. Failure to do this can result in the parking brake not releasing properly. Early J-Bodies do not have a spring. Install a new spring and set it to 6" as noted above. Repeat the same steps for the other side of the car. Do not forget to remove the nut that's holding the rotor in place before re-installing the wheels. Install the wheels and torque the lugs to 100 ft. lbs. (stock) or 90 ft. lbs. (tuner lugs). Proceed to properly season the rotors and bed the pads.